I often use the same Pokemon across all games from a set pool. And, using the awesome power of Pokesav, I can even use the very same Pokemon for all games now. 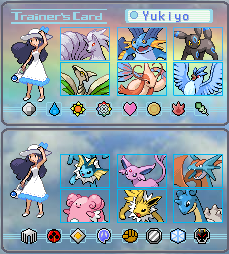 Trainer's card showing often used teams. I normally restrict myself to collecting Gen 1, 2 and 3 only. Anything beyond those first three generations is strange and no longer feels like original Pokemon to me. Pool used for battle. The Pokemon at the bottom are more rarely used.